All the ins & outs for playing golf in this beautiful Spanish coastal area. 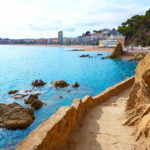 The Costa Brava is a coastal area that is very popular among holidaymakers who are looking for a holiday with plenty of sun, sea and sand. But the Costa Brava has a lot more to offer than this typical picture: it also has bustling cities, ancient buildings, picturesque villages, breath-taking nature and beautiful places for golf enthusiasts. The natural beauty and splendour and the wonderfully mild climate of the Costa Brava are the perfect conditions for a golfing holiday. Blessed with a number of exceptional golf courses, it is no surprise that the Costa Brava is becoming an increasingly popular place for golfers. 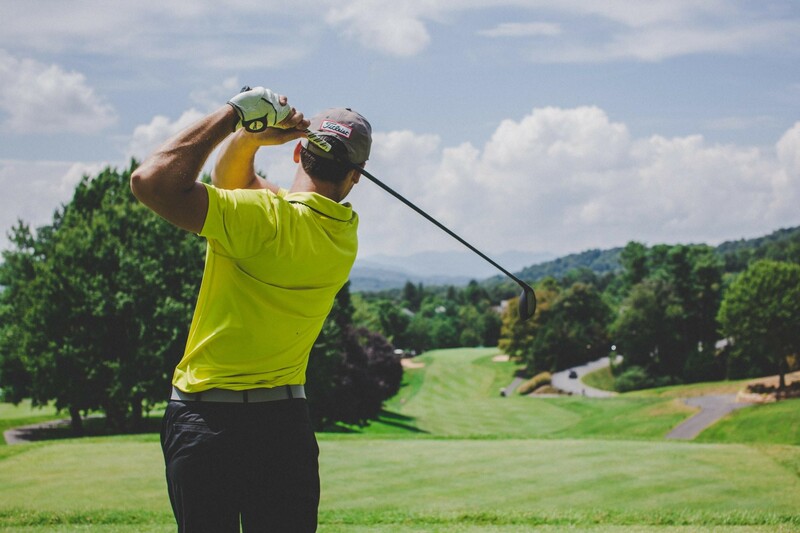 Here you will find golfers of all levels, who like to combine their passion for the sport with a holiday in one of the most beautiful regions in Europe. Would you like to know what the Costa Brava has to offer in terms of golfing? Then read this Costa Brava golfing guide and discover all the ins & outs for a great golfing holiday in this Spanish coastal area. The Costa Brava is located on the northeast of the Spanish coast and is part of the province of Girona. It extends over a length of 214 kilometres: from the French border to the Costa del Maresme. 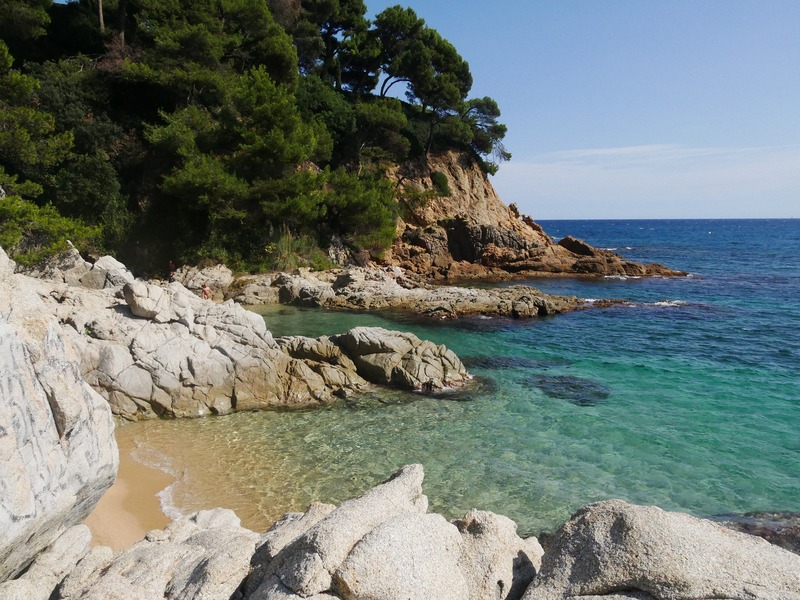 Costa Brava literally means ‘wild coast’, which in turn is due to the rocky coast for which this area is famous. This rocky area is interspersed with beautiful bays, where the well-known and popular holiday resorts are located. The seaside resorts of Tossa de Mar, Lloret de Mar and l’Estartit have lots of hotels and holiday homes and offer numerous leisure facilities. 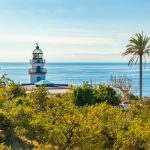 The coast between Rosas and Tossa de Mar also has plenty of lovely small coastal towns like Pals, Begur, Tamariu, Aigua Blava and Calella. These are slightly less touristy but also offer plenty of nice accommodation to rent during your ultimate golfing holiday. 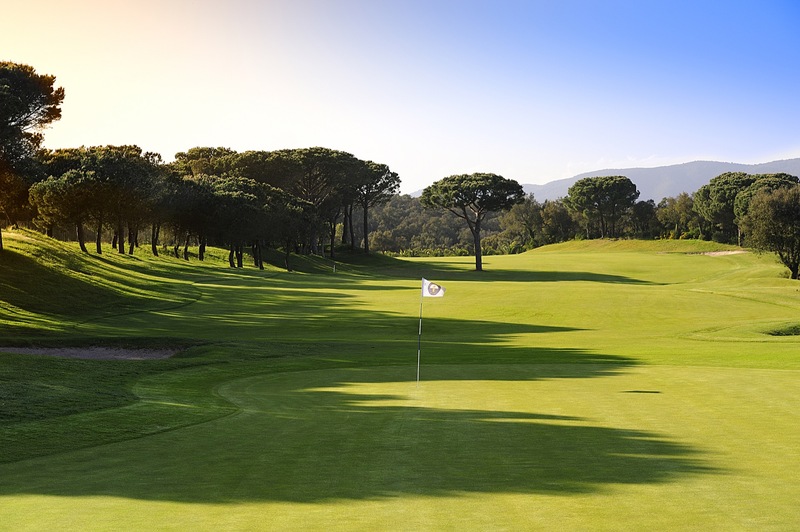 The beautiful natural environment ensures that the Costa Brava has the most stunning golf courses in special locations, with well-groomed velvet greens that are ideal for perfecting your swing. The dramatic coastline and the view of the Pyrenees complete the picture of this special location. 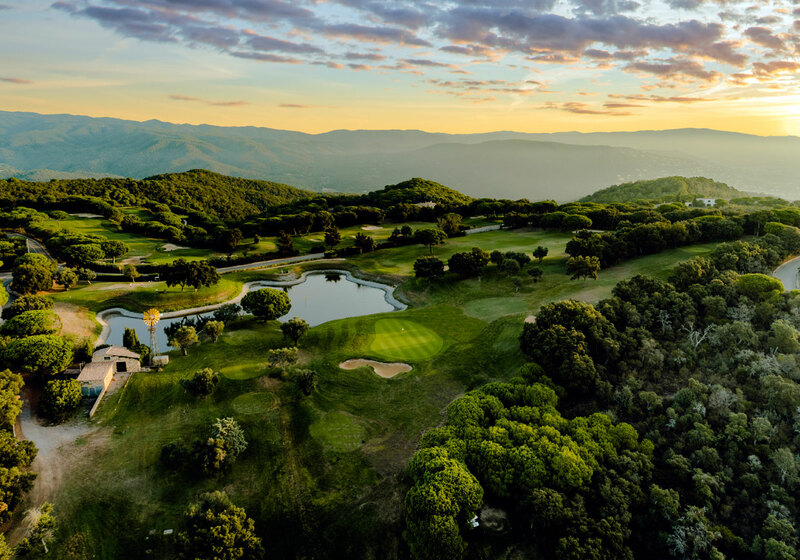 This region between the foothills of the Pyrenees and the clear waters of the Mediterranean offers a range of first-class golf experiences in a natural and unspoilt environment. The Costa Brava also offers the opportunity to combine improving your handicap with the chance to experience many historic, cultural and gastronomic delights. Combine your golfing holiday with a visit to one of the many authentic villages, discover the bustling culture, enjoy the lovely beaches, explore the beautiful natural environment or discover Catalan gastronomy. The Costa Brava complements your golfing holiday perfectly and, thanks to the mild climate, you can enjoy all of this all year-round. 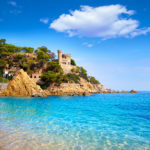 The climate on the Costa Brava is influenced by the Mediterranean and is therefore very mild and pleasant; it doesn’t have icy cold winters or very extreme hot summers. The Mediterranean climate, with its moderate mild winters, its pleasantly warm springs and autumns and its dry and warm summers, is perfect for golf lovers. The average annual temperature on the Costa Brava varies between 14°C and 20°C. During the summer months this varies between 21° C and 28 ° C and during the winter between 6° C and 10° C. The best period to visit the Costa Brava, for your ultimate golf experience, is between April and October. That is when the temperatures are most pleasant and in general it rains very little during this period. 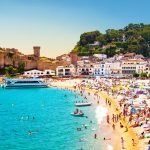 However, you must keep in mind that the high season (July and August) on the Costa Brava is normally very tourist-heavy and the temperatures can also rise significantly during the day. If you want to enjoy your golfing holiday during a quieter period and in moderate temperatures, then visit the Costa Brava in April, May, June, September or October! It is entirely up to you, depending on which season appeals to you the most: in any case, you can continue to play golf all year-round. Club Golf d’Aro or Mas Nou Golf Club (18 holes, Par 72) is located in the Gavarres mountains about 300 metres above sea level. It has a special location high on a hill above the coastal town of Platja d’Aro, in a spectacular setting with a panoramic view over the surrounding coast and landscape. Designed by the architect Ramón Espinosa, it is a challenging course with water obstacles and strategically placed bunkers. In addition, this course has a lot of differences in height and offers you a challenging but fair test of your golfing skills. This beautiful golf club has also organised various European Ladies Tour events. The clubhouse, located in an old stone building, and the course itself are maintained in perfect condition. Here you will also find a pitch-and-putt-course with 9 holes. 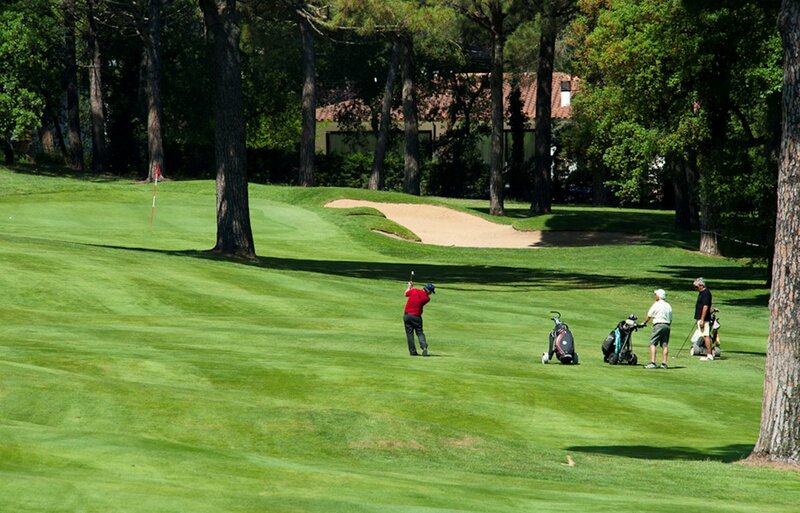 Club Golf d’Aro is one of those picturesque courses that you will never forget, regardless of how you play there. The Costa Brava Golf Club (18 holes, Par 70) is located nearby the lovely beaches of Platja d’Aro and Sant Feliu de Guíxols. The first 9 holes, surrounded by trees, are completely different from the next 9 holes that are located on flat, wide fairways. It is a special, private course with a lot of differences in height that accepts green fees all year-round and is maintained in very good condition. The clubhouse itself is a Catalan farmhouse from 1841, which also really contributes to the special character of this golf course. The Empordà Golf is considered to be one of the best courses in Catalonia, it has two different courses: Empordà Links (18 holes, Par 71) and Empordà Forest (18 holes, Par 73). 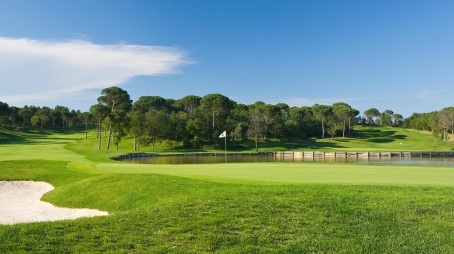 Empordà Golf is also host to one of the PGA European Tour Qualifying Schools. With the best practice facilities, Empordà has four 9-hole courses, which are combined into two separate 18-hole courses. The first 18 holes have the wider links course style with lakes, dunes and large, deep bunkers. 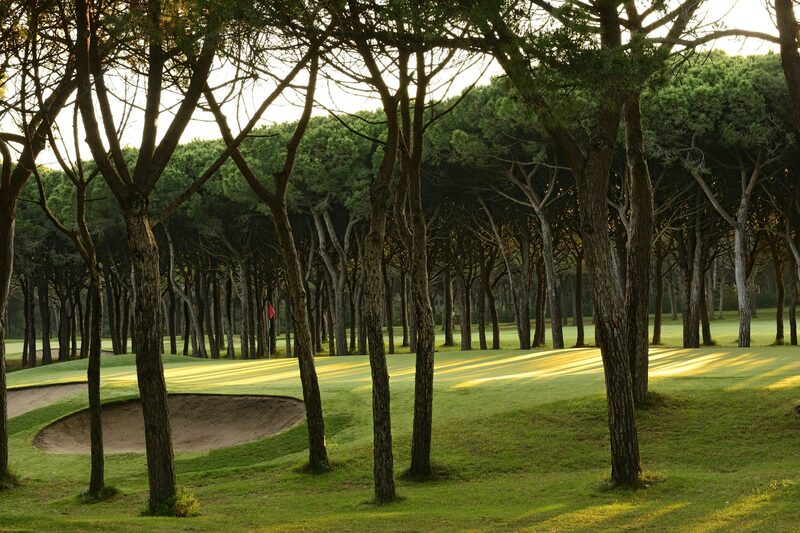 The next 18 holes are located in a beautiful wooded area with the typical Mediterranean pines of the Costa Brava. The Platja de Pals Golf club (18 holes, Par 73) was founded in 1966 and is therefore the oldest golf course in the Costa Brava. In 1972 the first European PGA Tournament in Spain was hosted here: the Spanish Open. Since then the course has been considered to be one of the best in Spain, thanks to its design and construction, and has been the venue for numerous international tournaments. This golf course runs parallel to the beautiful beach of Pals and is surrounded by dense green pine forests. There are older trees along the fairways, which makes it a challenging test of golfing skills in a beautiful setting. It also has a great driving range and an old-fashioned style clubhouse with comfortable leather sofas and a great patio from which you can watch the other golfers. Founded in 2000, the Serres de Pals Golf Club (18 holes, par 72) was designed by Ramón Espinosa. It is located on agricultural land and has a lovely view. The course is a challenge for golfers of all levels as it includes three different areas with slight hilltops, pine forests and fairways between the lakes. This golf course is therefore a challenge for all handicaps. The TorreMirona Golf & Spa Resort (18 holes, Par 72) is located a few kilometres from Figueres in a spectacular natural environment. The course is reasonably open, making it rather forgiving, expect for a few holes. The course itself has wide greens, numerous lakes and is incredibly beautiful with a stunning view of the Pyrenees from a large part of the course. The greens are in excellent condition and roll well, making it a pleasant experience. This golf course is perfectly maintained all year-round and offers the golfer a spectacular view. The club also has a prestigious Golf Academy with three practice holes. The Peralada course (18 + 9 holes, Par 71) of Golf Club Peralada is one of the most beautiful golf courses in the region and attracts players of all handicaps. It is a resort course where you can pay green fees all year-round and get a truly varied game of golf with a lovely view. The course has many large greens, open holes, tight holes, differences in height, doglegs and lakes. This course is part of the Peralada Golf Resort and also has a golf school. In the castle you will also find a renowned wine spa. Founded in 1992 and designed by FG Hawtree, the Girona Golf Club (18 holes, Par 72) is immaculately maintained and is the only course in Spain that has been sown with ‘Pencross grass’. The natural location of the course provides elegant features and is a challenge for golfers of all levels. The Girona golf course has a lovely clubhouse made of natural stone, which fits perfectly in the environment. 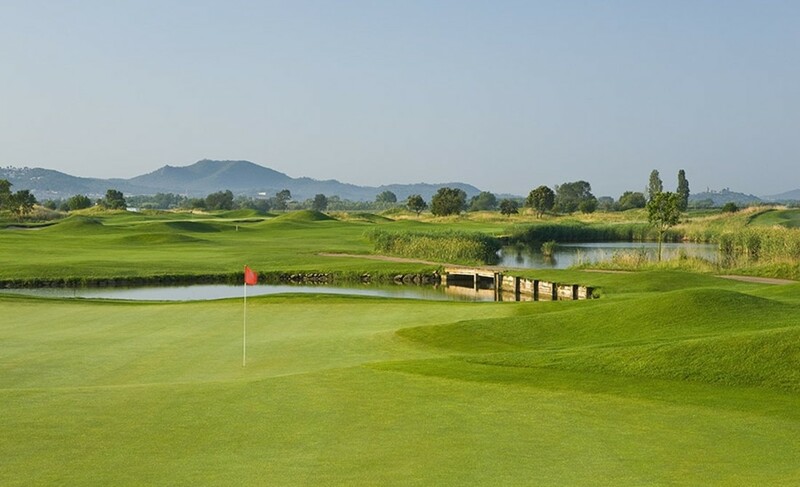 With the Pyrenees in the background and a short drive away from Girona, PGA Catalunya offers two truly beautiful golf courses: the Stadium golf course and the Tour golf course (both 18 holes, Par 72). The Stadium course was designed by the Spanish Golf legend Ángel Gallardo and Ryder Cup star Neil Coles and was opened in 1998. It has already organised a number of top golf events, including the Spanish Open in 2000 and 2009 and the PGA European Tour Qualifying School Finals. Since the inauguration, the Stadium has been named several times as the number one golf course in Spain in various influential golf course rankings. The Tour course is a more relaxed course that is fun for golfers of different levels. The fees and memberships of the golf courses vary per golf course. The prices can also be subject to the seasons. January, February, November and December are normally classified as the low season. March to October are classified as the middle or high season, depending on whether you play during the week or on weekends. Do you like to play golf on various golf courses? The Costa Brava Empordà Golf Course Association offers a golf pass, called Golf in Costa Brava, that you can use to play golf for two weeks on 7 courses in the Costa Brava, Empordà and Girona: Empordà Golf, Torremirona Golf Club, Golf de Pals, Club Golf Peralada, Club Golf d’Aro, PGA Catalunya Resort and Club de Golf. By paying only once at the golf course where they offer the golf pass you can go to any other golf course that is part of this offer without having to pay anything further and having to wait till everything is arranged. You can choose between 3 green fees for 225€ or 5 green fees for 350€. Jeans, sports shorts, mini-skirts or swimming shorts. Handicap certificate – required or not? This also varies per golf course, but most golf courses on the Costa Brava and in Spain generally try to implement this. However, this does not mean that they will always check handicap certificates. Do you have a handicap certificate or card? Then take it with you. If you don’t or if you do not have one, it should be fine, and it is unlikely that you will be refused from one of the golf courses on the Costa Brava. Do you want to be sure? Then contact the golf course of your choice. The great thing about the Costa Brava is that it is a relatively small coastal area, so it is very easy to combine a visit to various golf courses. Another wonderful fact about the Costa Brava is that it really has something for everyone! If your fellow travellers aren’t as enthusiastic about playing golf as you are, they can still have a great time on the Costa Brava too. While you have a game on the golf course they can enjoy a day at the beach, experience some culture in Barcelona or go on a shopping trip! And if you want a day off from playing golf, you can all enjoy some great holiday moments together! This way you can tailor a perfect holiday to everyone’s wishes! To fully complete the picture of a dream golfing holiday, you can rent a stunning private holiday villa with swimming pool, situated in a central location on the Costa Brava, which serves as the perfect quiet base for visiting various golf courses but which simultaneously offers the proximity of the beach, sights and attractions. In a holiday villa you have plenty of space, ideal for storing your golfing gear, and you are not, for example, restricted to just 1 hotel room. You can enjoy some quality time with your friends or family in peace, after spending a long day on the greens. Spend a wonderful day together at the private pool, enjoy a drink on your own terrace overlooking the sea or enjoy an alfresco dinner on a warm summer evening. You can plan your days as you wish, after all you are not subject to strict check-in times, meal times and tour schedules when you stay in your private holiday villa. In general, renting a holiday home is one of the most cost-effective options for a holiday, especially in the low season! You can enjoy all the comforts of home here, and sometimes even more! Would you like to receive more information about the options available for renting a holiday villa for a golfing holiday? Please do not hesitate to contact us; we are genuine experts when it comes to Spain and are happy to help you!